I’ll admit, I tend to eat more treats during the holidays too. The reality is, we all do. We’re human. However, I am a firm believer that moderation is key for our sanity and health. Most of the time this translates to a healthy balance of fruits, vegetables, whole grains, lean protein, and a few treats sprinkled in here and there. Though sometimes, our diets aren’t as perfectly balanced as we might like, and we need to step back and refocus our food choices. Too often people turn to juice cleanses, fad diets, no carb diets, or meal skipping as a way to “jumpstart” their weight loss. I hate to be the bearer of bad news, but these don’t work. In fact, these quick fixes often do more harm than good, proving to be extremely calorie restrictive. Within a few weeks you’ll feel deprived and find it difficult to stick to your resolution. So what should you do? The key is finding something you can stick to for the long run. This is about making a lifestyle change. To help you do that, I have laid out six steps I take with my clients to help them create achievable health goals. 1. Let go of the guilt! Stop the excess restrictions and food rules. Stop labeling food “good” or “bad”. It does not deserve to have power over your emotions. 2. Recognize areas that can use improvement. For instance, do you skip breakfast? Or perhaps you find yourself grazing all night after dinner. Make a list of 2 or 3 areas you would like to work on. Be honest with yourself, but also be kind. 3. Make a nutrition related goal. Use the list you created above and focus on one behavior you want to change. For example, you may choose to start by incorporating breakfast in your morning routine. Which, by the way, is a big part of a healthy lifestyle! Once you have conquered your first goal, you can add another to the list. 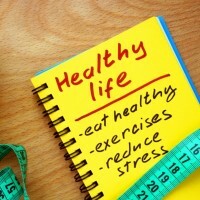 Learn how to set effective health goals with these easy steps. 4. Define roadblocks. Once you have come up with your goal, make a list of three things that stand in the way of reaching your goal. Maybe, “long commute to work,” “too tired to exercise,” “sugar cravings,” or “hate cooking” resonate with you. 5. Uncover detours. Now it’s time to dig deep. Take a look at your roadblocks and consider reasonable solutions. Perhaps cooking seven dinners from scratch won’t work. However, can you commit to making a large batch of roasted vegetables on Sunday and buying a rotisserie chicken at the store? Planning detours around roadblocks keeps you on track even in the midst of a busy schedule. See 5 quick and healthy meals with limited time and money, quick microwaveable meals, easy stove-top meals and quick dinner fixes. 6. Now it’s time to put your goals into action! Take one step at a time, and be kind to yourself when you feel you have fallen off track. Acknowledge what happened, make a plan for avoiding it in the future and keep moving forward. The steps above will help you to narrow your focus and get back to your resolutions. The sense of accomplishment you’ll feel after succeeding in small changes will be the best motivator to forge ahead!